Ramblings of a multi-tasker: WARNING! Before you read this, please be aware I will be making confessions about my wild lifestyle. WARNING! Before you read this, please be aware I will be making confessions about my wild lifestyle. Hello, my name is Karleen and I am an addict. A ‘back to school’ sign in Ryman’s window is like a blue light to a bug for me. I just can’t help myself. I forgot to list it on blog post one as one of the things I like. I don’t just like it but I love stationery. I own so many pens and some people would see it as a problem. I remember a time at uni when one of my new housemates was rooting around in my room for something when she came across a large red Chanel branded box. She slowly lifted the lid to see what beautiful belonging was being encased in the large red box. She looked down and then she looked straight back at me. “What the hell is this! 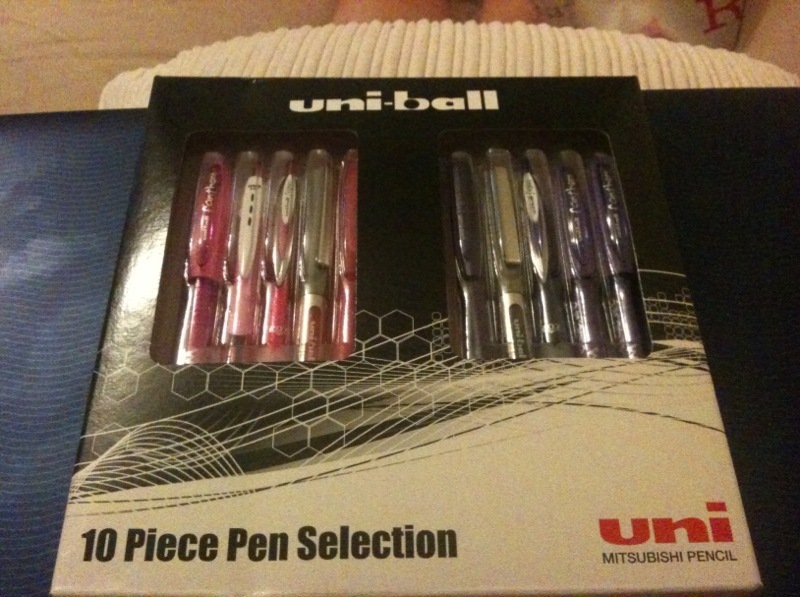 ?”She didn’t understand why the box contained a huge array of pens. Cat's reaction to my pen box made me realise that perhaps I like pens more than most people. The box contained a lot of pens. I like all sorts of pens and I own a massive range of different colours, different brands, highlighters, silver pens, gold pens, highlighters, fineliners, Sharpies and I even have a pack of those italic ones like your primary teacher had to write your name on labels. I can't walk past Paperchase without buying something and in fact it doesn't even have to be a pen. I'd be more than content with a pretty notebook. As the nieces are coming over tomorrow to do arty stuff I obviously had to go into Ryman’s to buy some extra glue, wobbly eyes, coloured lolly sticks, you know, the essential materials. This was to be added to the box of feathers, pipe cleaners, silver stars, little crystals and scrap paper shapes that I already have, for the benefit of the girls, obviously! 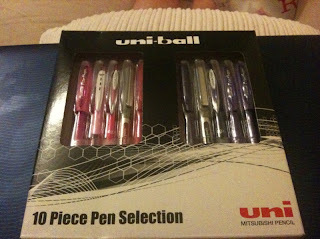 I couldn’t possibly walk out of there without buying something for myself so I went for the uni-ball 10 piece pen selection. I love buying new pens nearly as much as I like buying new make-up and in essence make up is like paint and crayons for your face. As you know, my calf was niggling me last night and I had a night off running and opted for swimming instead. I wish I’d done the same again tonight because my leg is definitely not happy after my 4k loop. Despite being keen to beat my Parkrun time tomorrow morning, I am really nervous about injuring myself and I fear I may have fallen into that foolish trap where I have done too much, too soon. My leg is really quite sore. I am so annoyed at myself but onwards and upwards so I am going to head to the gym first thing and do some swimming and stretching. Opting out of Janathon on day 7 is just not an option for me. Catch you tomorrow, I’m off to play with my pens. Ps.I do hope I didn't shock or offend with the unveiling of my not so secret addiction.